Tamil calendar and Tamil Panchangam are followed by the people of tamil community world wide, especially for traditional festivals and religious events. ‘Thai month’ is the 10th month in the tamil calendar. The most auspicious days and festivals in the month are Pongal festival, Maattu Pongal, Kaanum Pongal, Thai Amavasai and Thaipoosam. It is a tradition in some families to light the Maavilakku on Fridays of Aadi and Thai months of the Tamil calendar. People light the maavilakku, either in the temples or in their homes. In tamil, Thai and Aadi Fridays are called ‘Thai vellikizhamai and Aadi vellikizhamai’ respectively and is considered auspicious. What is to be cooked at home? General pandigai thaligai is made along with ‘Manja pongal’, a simple pongal with turmeric powder and tur dhal and is also offered to Goddesses with a payasam, preferably arisi payasam. Thamboolam is given to ladies nearby. What is puthukku paal thelithal? 'Puthukku paal thelithal' is a ritual/tradition followed in almost all tamil families. Puthukku paal and its significance: During the tamil months of Thai and Aadi, people also worship snakes. They visit temples where there are idols of serpents called as 'Naagar', (some people offer milk to ant-hills and snake pits, but we do this pooja to idols at temples) and pray for wealth and prosperity . It is believed that doing this pooja is a remedy for naga dosha. Friday is always auspicious for Hindus. On any one Friday of Thai and aadi month, people do pooja for ‘Naagar’ in nearby temples. 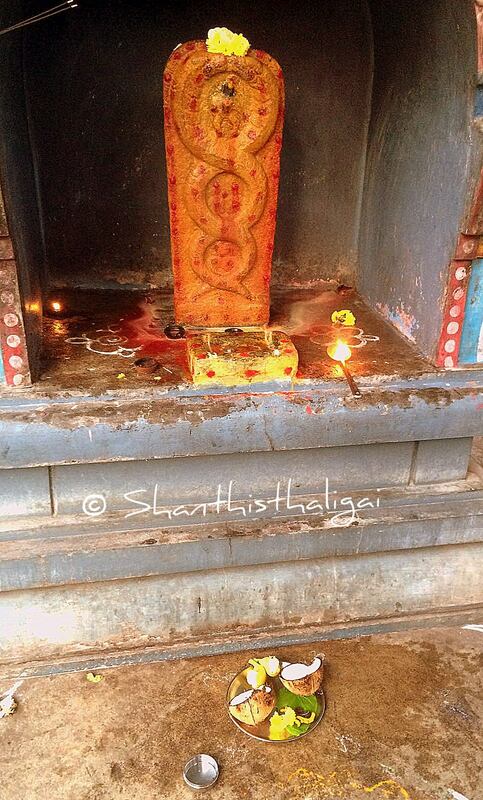 The tradition of offering milk to snake idols or snake pits is called ‘puthukku paal thelithal’. As it is hard to find a snake pit, the offering is made to snake idols in temples. Usually, ‘Naagars’ can be seen under the peepal tree in all temples. Anyone can do Pooja to this naagar. This festival is generally observed by women , praying for the well being and long life of their husband and children. There is a belief that unmarried women who do the pooja will get good husband and childless couple will be blessed with a child. Though there is no hard and fast rules to worship snakes, elders of each family follow certain ways of pooja. There may be slight variations in the method of observing these rituals. I too observe this tradition at home on Thai and Aadi Fridays. This is a simple method of this ritual/tradition followed in our home. Those who do not have elders at home to guide can follow this. Take oil bath, wear madisar. Items to be taken to the temple: Itemwise it may seem to be more, but all these things can be arranged neatly in one basket. I have numbered it for easy reference and memory. 1. Mostly water will be available in temples. If not take water in a bottle. Sprinkle some water on the platform, wipe with hand and put a padi kolam. Take a plate and arrange vethalai, paaku, manjal kizhangu, flower, plantain and coins and keep ready. This is for offering. Take another plate and arrange the tamboolam for ladies. Take little water in tumbler, put a spoon and keep ready for neivedhyam. Light agal lamp and place near the idol. Take water in sombu and perform abishekam to naagar. “Naagaraaja, Sarparaaja, kaattile vaazhndhaalum veettile vaazhndhaalum, thalaiyaik kaattaamal vaalaik kaatti pO, kudumbathil ellaarayum rakshithu arulanum”. Break the coconut and keep it in the vethalai paaku plate. Light agarbathi and show it to the idol. Offer neivedhyam. Light camphor and do karpoora arathi. Pray for all in the family. Do pradakshinam two times. Take aarthi and pour down. Some temples may not allow to pour down the aarthi. So mix only very little water with turmeric powder and chunam and pour it in the kolam outside the temple. Take a set of tamboolam and keep it near the idol. Some poor people who come to the temple may take it. Give tamboolam to ladies who come to temple. Then go to the temple and have a darshan of the deity also. Give tamboolam to neighbourhood ladies. Very nice mami. Thanks for the information. very nice maami. my amma does that in the month of adi,very nice suggestions.